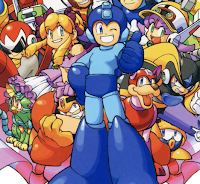 Rockman Corner: Happy 2 Million Hits! This is the only Rockman site I visit anymore. *Hold up a glass* Here's to another couple million hits! Congrats! I know this is one of the best Mega Man blogs I've ever seen! Happy 2 mil! @Anonymous #1: Yeah, pretty much the same for me. A great ロックマン/Mega Man blog. Keep up the great work! Thank you for being so active where even Capcom itself is not. You keep my Megaman fandom alive. I've always been amazed at how you're able to make a post nearly every day and always every week. That's impressive considering the fragmented nature of the release of new Megaman games. You've held the community together better than any of us could hope to achieve, Protodude. On behalf of the entire ELB team, with all our most sincere respect and well wishes, here's to millions more hits. Happy Two Million, Protodude, You definitely deserve it! Nappa: Hey, Vegeta! What does the scouter say about Protodude's huts? Vegeta: IT'S OVER NINE THOUSAAAAAAAND!!! Heh heh, sorry, I couldn't resist. As many people have said already, congratulations. On this blog, the informations adeeared before it appears on the official sites lol. Congrats Protodude, your blog brings the most rockman information and usually brings it the quickest. Here's to 2 million more hits! Finally you got the amount of views you deserve! Heres to another 2 million more! Whoops, I meant to say "hits" on the last comment, rather than "huts". My mistake. Thanks so much for all your hard work! It was worth it. CONGRATULATIONS! Living in Japan, it's always hard to find information on upcoming MM stuff. But with the help of this blog, I've already collected several things I wouldn't have found on my own. This is definitely the best MM blog! Congratulations on 2 million hits! As has been said, you keep your readers coming back because there's always something new to come back to-- you update so often and so consistently. Any fandom news site would blush in envy. your site is a must-stop by daily!! my best wishes for you!! Congrats!!! this is my favorite megaman blog!! BTW that image is awesome is it official or fanmade?